Personalised Baileys Design Bubble Based Glass Tumbler. It is your responsibility to make sure we receive your. engraving details correctly as any mistakes cannot be rectified once. Text Line 3: (20 characters). Personalised Baileys Design Bubble Based Glass Tumbler. the product has been engraved. It is your responsibility to make sure we receive your. engraving details correctly as any mistakes cannot be rectified once. Pair Of Baileys Irish Cream Glasses. Boxed set, 6 unused glasses. Beautiful, just over 8cm tall. The box showing its age but secure. New listingBaileys Irish Cream Tall Stem Glass Stylish Quality Gold Logo Great Gift! Stylish Baileys Tall Stem Glass. It has been used once and so is in Excellent Condition. Has just the slightest wear on the gold rim only visible on very close inspection. 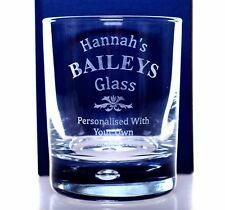 Personalised Baileys Design Crystal Glass Tumbler. It is your responsibility to make sure we receive your. engraving details correctly as any mistakes cannot be rectified once. Text Line 3: (20 characters). Baileys Irish Cream Glass Tumblers. swirl pattern, etched logo's. rubbing to decoration, small scratches and marks to the surface. Natural wear and tear, utensil scratches, gilt wear, stilt marks, light natural crazing and firing faults. Heavy base with decorative trapped air bubble. Approx 11cm tall and 8cm across the top. Perfect collectors item. Baileys Irish Cream. Natural wear and tear, utensil scratches, gilt wear, stilt marks, light natural crazing and firing faults. Set of 4 small stem glasses,in very good condition. rubbing to decoration, small scratches and marks to the surface. Size approx 82mm tall x 48mm wide at top x 45mm wide base. Baileys logo printed on side of glass. The BAILEYS logo to front of glass. Get images that. make Supersized seem small. A SET OF 2 BAILEYS GLASSES. BAILEYS LOGO ETCHED IN A CURVED BANNER ON EACH GLASS. A GOOD SIZE GLASS FOR YOUR BAILEYS WITH OR WITHOUT ICE. HEAVY BASE WITH BUBBLE IN THE CENTRE. The perfect glass for Bailey's lovers. Baileys Drinking Glass Heavy Base With Bubble. Etched on the front. Great condition. Personalised Baileys Hearts Design Bubble Based Glass Tumbler. the product has been engraved. Bottom Left Text Line 1: (15 characters). Bottom Left Text Line 2: (15 characters). Bottom Right Text Line 1: (15 characters). Approx 12 cm high, around the top 7 cm approx. 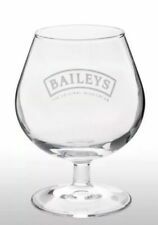 Baileys Irish Cream Round Glass Tumbler with Bubble Base.